This is a British locational surname, but of Olde English origins. There are many places called Westwood in the counties of Kent, Wiltshire, Warwickshire, Worcestershire and Yorkshire as well as Westwood near Newport, in Fife, or near Stanley in Perthshire, both Scotland. In all cases the place name derives from the pre 7th century words "west", meaning west (of the village), and "wudu", a wood or forest. Locational surnames were developed when former inhabitants of a place moved to another area, usually to seek work, and were best identified by the name of their birthplace. This surname is one of the earliest on record and early examples include: Alan de Westwude of Gloucestershire, in 1221, and John Westwod of Essex, in 1371. Robert Westwood, who "witnessed a notarial instrument" in Fife in 1495, was the first recorded Scottish namebearer. In 1579, William Westwood of Gloucestershire was a student at Oxford University, and in April 1634, William Westwood, aged 28 yrs., and his wife Bridgett, embarked from the port of Ipswich on the ship "Francis" bound for New England. They were among the earliest recorded namebearers to settle in America. 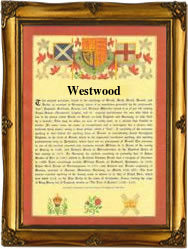 The first recorded spelling of the family name is shown to be that of Robert de Westwod. This was dated 1207, in the "Pipe Rolls" of Kent, during the reign of King John, 1199 - 1216. Throughout the centuries, surnames in every country have continued to "develop," often leading to astonishing variants of the original spelling.